"This is a quick, easy, and inexpensive project that makes something beautiful out of something that’s generally only functional." Looking for more great pet-themed DIY projects? Check out our tutorials for a cat taco costume and cat bed. If you have pets, you know that the typical pet dining experience isn’t exactly a glamorous one. Bowls are generally partially chewed, nudged all over the home, and overflowing with whatever was meant to be contained inside them. 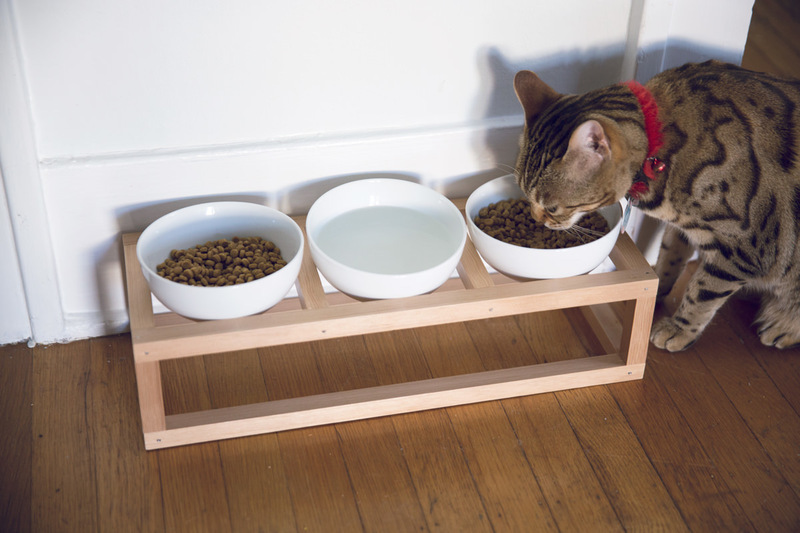 The inspiration for this project was my friend, who has several pets and wanted a stand to separate her cat’s dry food, wet food, and water bowl—hence the three slots. A while ago, she put together a simple design with wood stakes and didn't get around to putting a finish on the wood. Over time, with messy pets (who have messy eating habits), the wood has gotten stained and doesn't have quite the same finished look she was going for. Today, we’re revisiting this project with an upgraded version using moulding and a coat of polyurethane so it’ll look and stay clean. Maybe the pet dining experience can be a glamorous one after all. 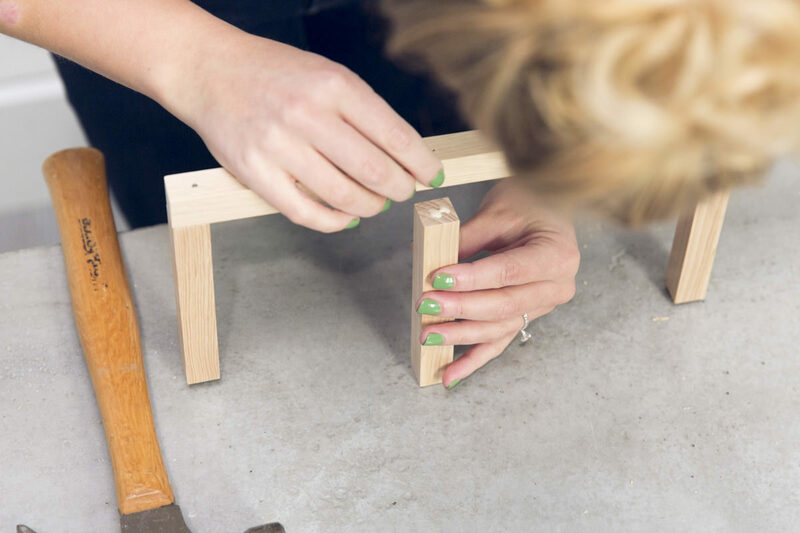 For this project, we’re using moulding—specifically, a 3/4" hemlock square, which is just about as simple as it sounds. It’s a square moulding that I find many, many uses for personally. It’s great for this project because you only need one 10-foot piece. 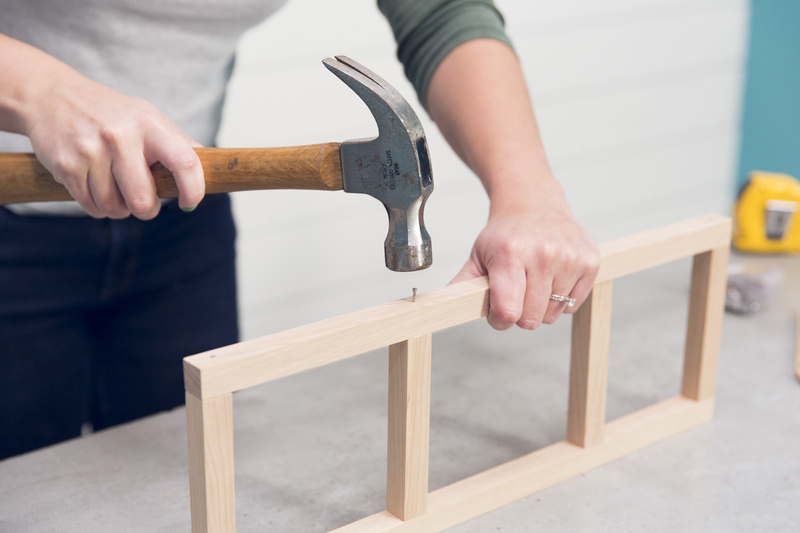 I picked up mine at Dunn Lumber, and went specifically for the hemlock because of its size (plus it’s a lovely wood—it happens to be one of my favorites), but you can use whatever you like. 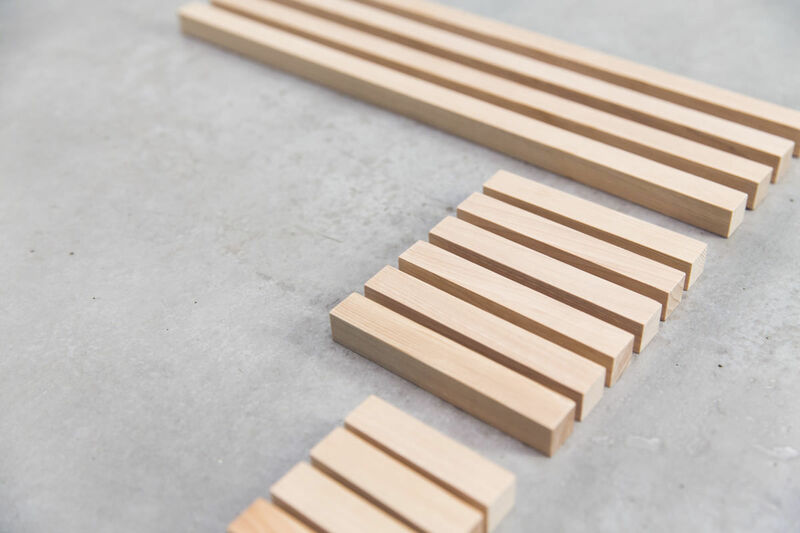 To start, cut six pieces to 5", four pieces to 3", and three pieces to 18". 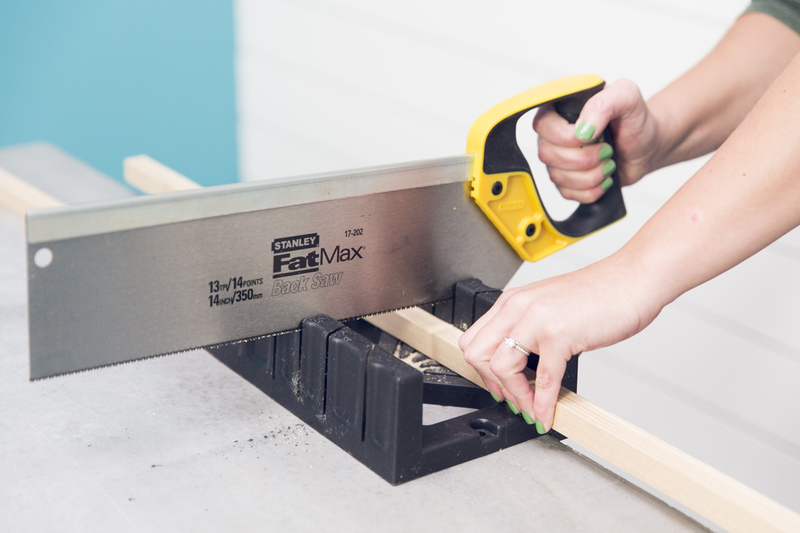 You can use a power saw if you have one on hand, or, because you’re only cutting through 3/4", you can use a hand saw and a miter box (that’s what I did). 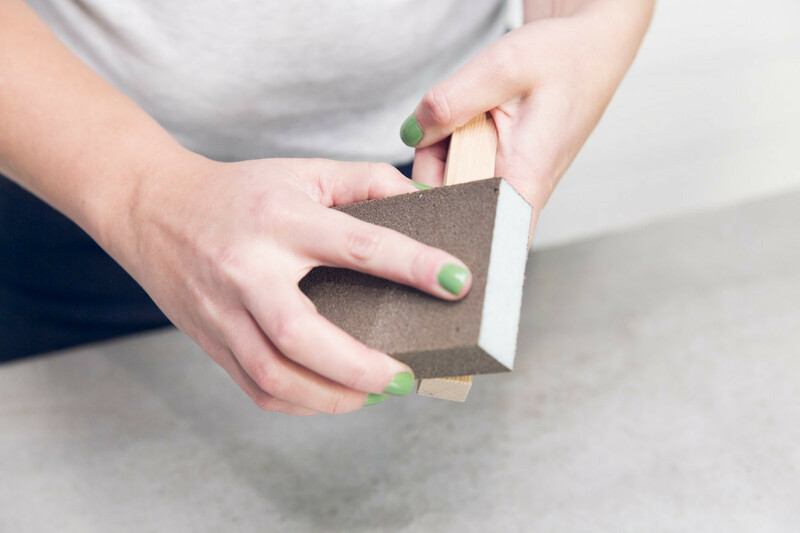 Once you’re finished, smooth the ends with a sanding sponge. 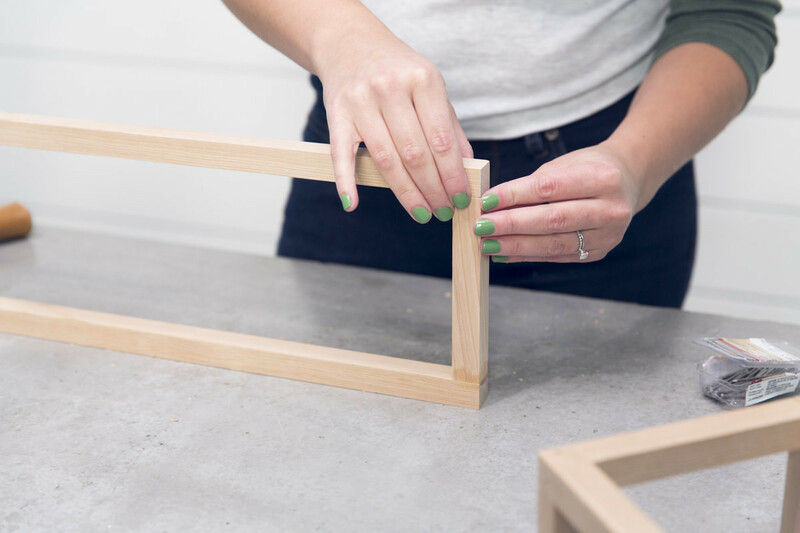 I like to sand the edges as well—they can be really sharp and prone to splintering. One note about the cuts in this step: We designed this project to fit three specific bowls that had already been purchased. The 5" square spaces fit our bowls perfectly, so make sure it works for yours, and if not, adjust as necessary. You may only have two bowls, in which case you’d need to do some simple math. 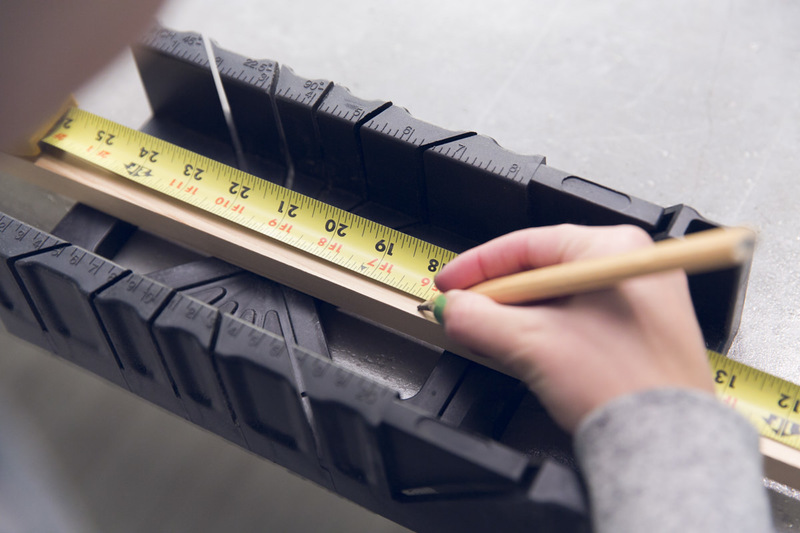 To start, take two 18" pieces and measure in 5 3/4" from either end. Mark with a pencil. 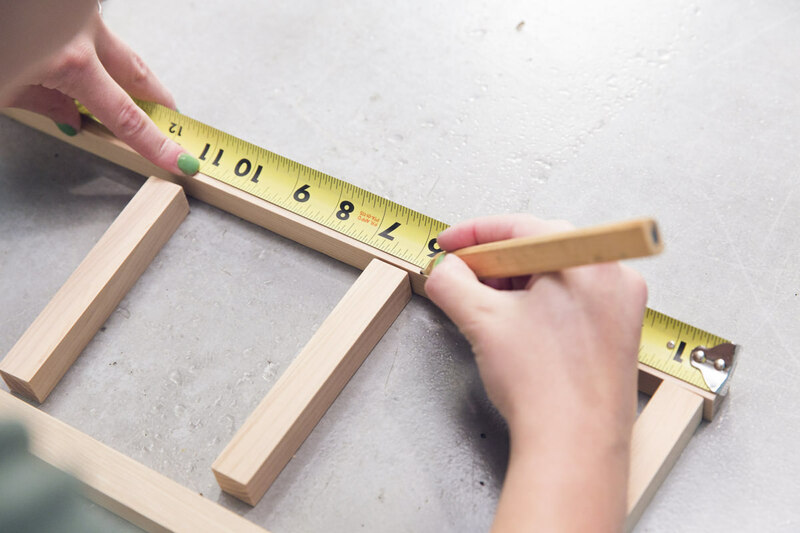 Then, take four 5" pieces and position them in between the two 18" lengths—two at either ends and two on the inside of each of the pencil marks. Pay attention to this part—I totally messed this up originally and put in the dividers unevenly (one on the inside of the mark, one on the outside), so keep an eye on things and make sure it looks even. 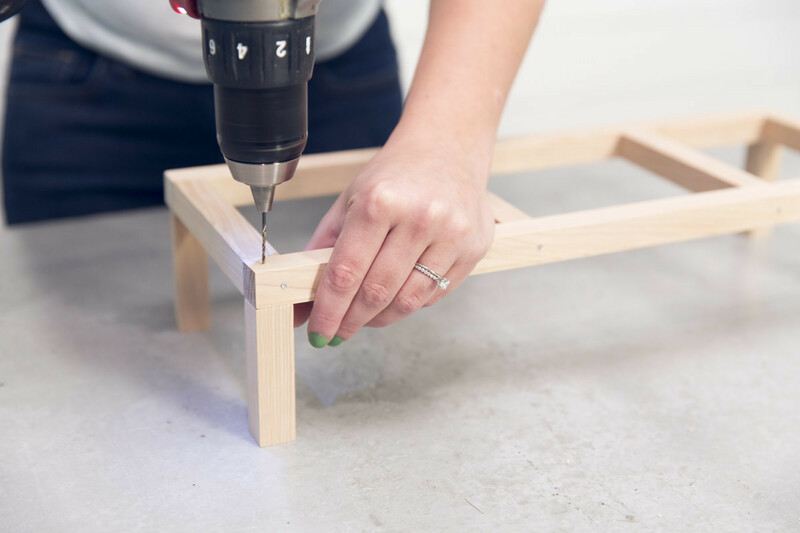 Pre-drill holes in the corners with a 1/16" bit—I find that makes it easiest to be precise when you’re working with something so small and lightweight. 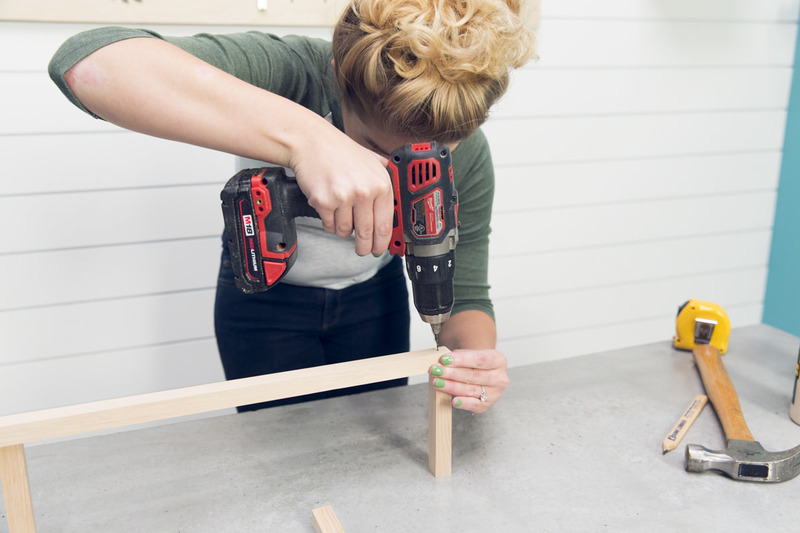 Don’t center the holes perfectly on the ends—we’ll eventually be nailing in more nails here to attach the legs of the stand so leave some room. 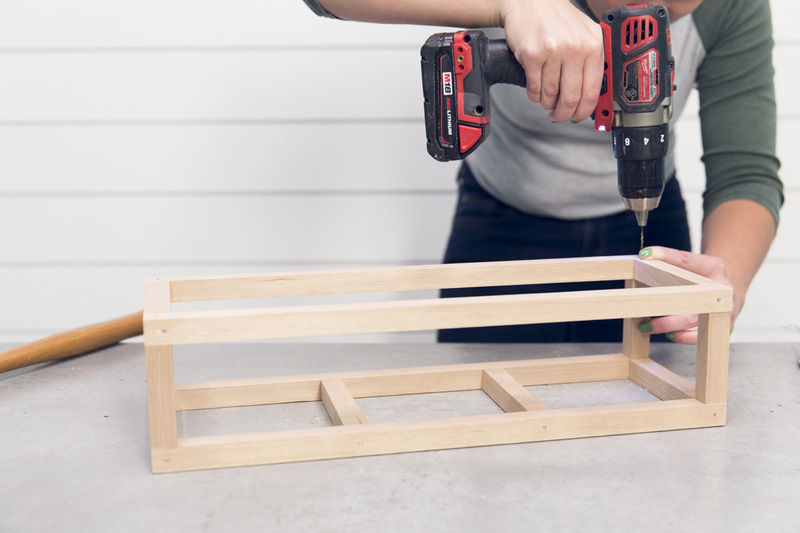 Once you’ve pre-drilled your holes, use wood glue and nails to secure. 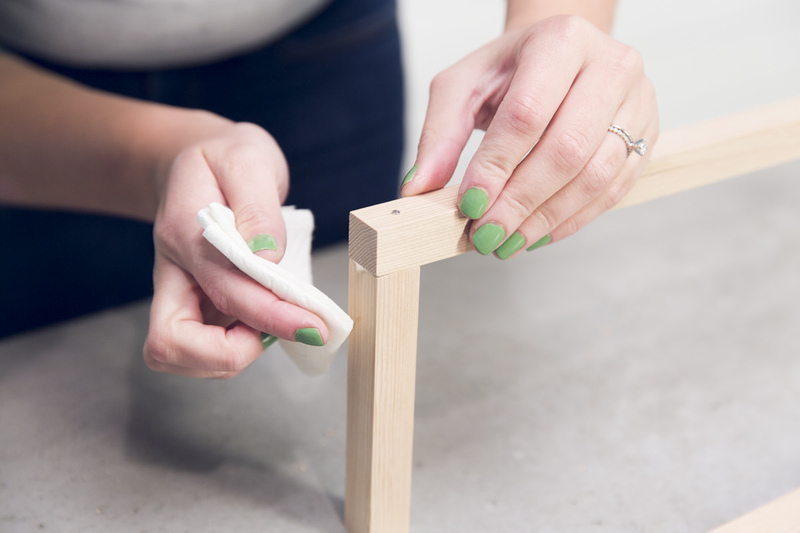 Wipe off any excess glue with a damp cloth or paper towel. Now that the top is assembled, it’s time to attach the legs. Position the four 3" pieces in each of the corners and pre-drill down from the top, steering clear of the nails that are already in place. 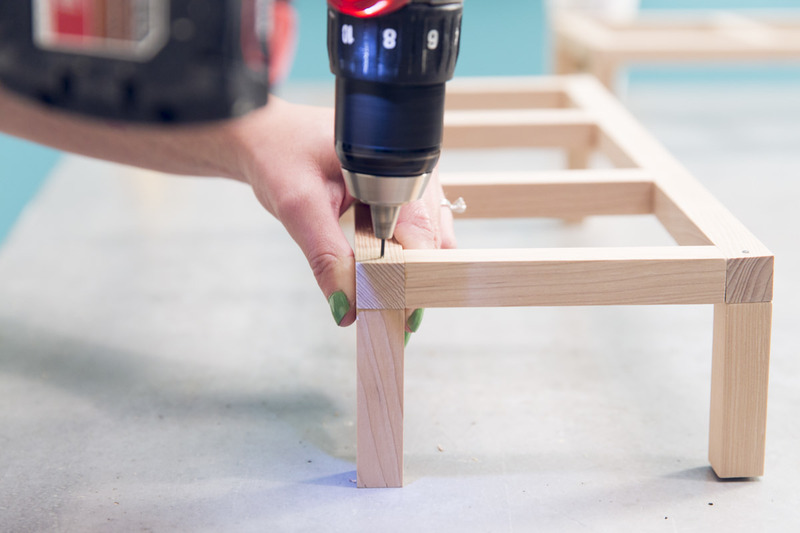 Secure the legs in place with glue and nails. Here, we’re repeating the same process as Step 2, excluding the two divider pieces in the middle. Form a rectangle with the remaining two 5" pieces and the two 18" pieces—the shorter sides should be sandwiched between the longer sides. Pre-drill, then secure with glue and nails. Next, secure the bottom to the legs in the same way you attached the top to the legs. Again, avoid nails that are already in place. 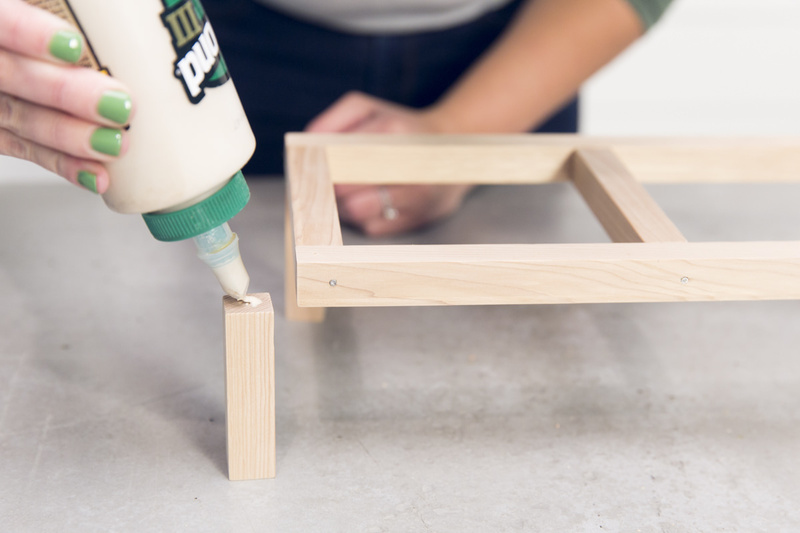 To keep this stand in good shape, add three coats of polyurethane, leaving two hours of dry time between coats. I chose a paint-on polyurethane instead of a spray-on because I find it gets better coverage and I wanted something nice and thick. There are a lot of surfaces to this stand, so when you paint on the polyurethane, you’re going to want to do so in a strategic, organized way. Once it starts drying, you can’t tell what’s been coated and what hasn’t, especially on the second and third coats, so pay attention! I found I kept best track when I wasn’t distracted by anything else (who knew?). 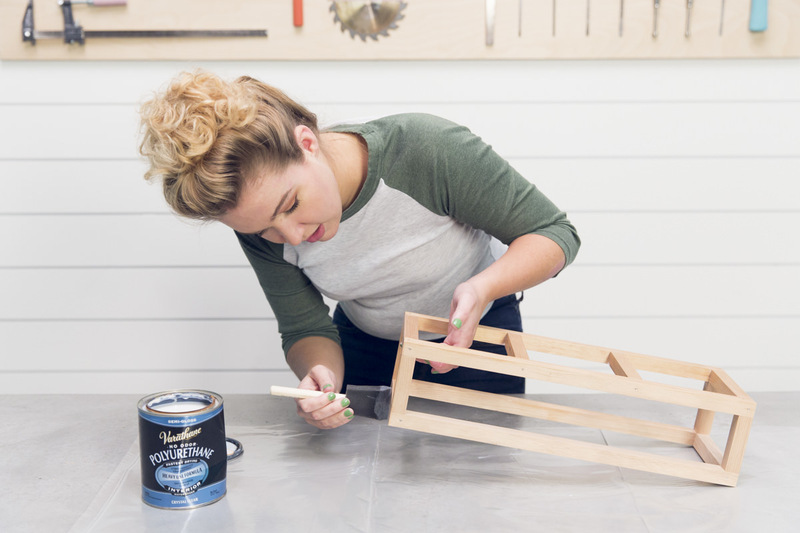 This is a quick, easy, and inexpensive project that makes something beautiful out of something that’s generally only functional. You could leave as-is if you like the natural look, or you could even stain or paint to match or contrast your decor (do this before the polyurethane coat). Add some rubber stick-on feet to keep it from being this draggable thing that takes all three bowls with it instead of just one (though I’m sure it’d be amusing to watch a pet attempt to move ‘em all), and you’re set! 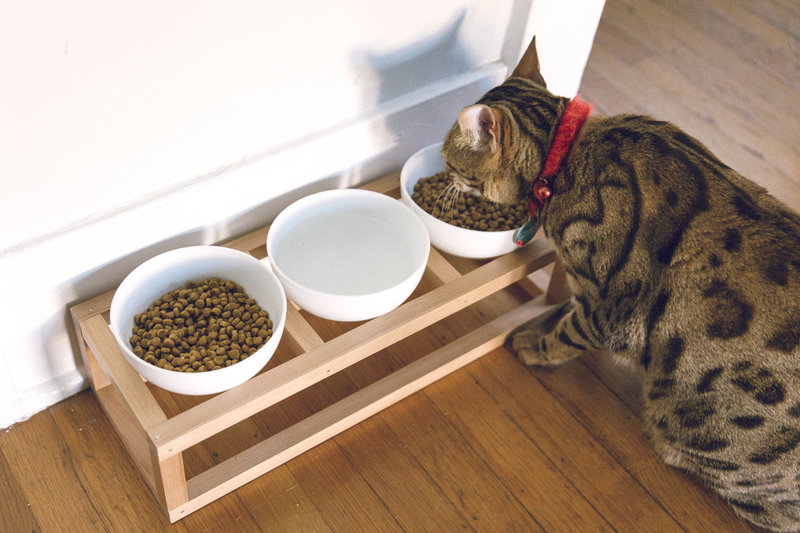 Pet dining, done better. From cedar to composite and cleaning to maintenance, here are some helpful tips and tricks for all your decking needs.